At five foot three, as I stood next to the photo op silicone gator head I found out I’m just barely dinner for a giant alligator. I shouldn’t have felt bad – the kid after me was a measly appetizer. Yet, as I looked around at the huge creatures and movie monsters all around me, I became very aware of my height. This summer, you can take your children, grandchildren, nieces, nephews, or other small friends to the Science Museum of Virginia’s new exhibit, How to Make a Monster, to see how they measure up. Who knows, Timmy might even be excited at the prospect of being an alligator’s equivalent to Cheez-its. Plenty of little snacks seemed delighted as they roamed the gallery looking at tidy display cases and other exhibits exploring the making of movie creatures, from design to production. 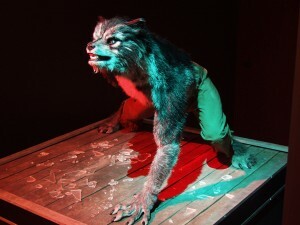 How to Make a Monster is the perfect exhibit for kids who are fascinated by the magic of movie props and animatronics. Museum-goers of all ages can operate different props, experiment with lighting, and view different costume designs from sketch to model to the final, fully functional suit. Children will enjoy checking out the huge animals and imaginary monsters, from gorillas of George of the Jungle 2, to dinosaurs, swamp monsters, and werewolves, to crocodiles, straight off the movie set of Peter Pan. The Inspector Gadget display case and a short film on the magic of the movies (featuring one of my family’s favorites, Babe) were also highlights. Recommended for ages 5 and up, How to Make a Monster explores the art and technology that goes into movie-making and animatronics. It isn’t scary or intimidating, so no worries if you have an anxious kid. The exhibit runs through September 17. How to Make a Monster at the Science Museum of Virginia is included with museum admission. Tickets are $11 with $1 discounts for ages 4 to 12 and 60+. For more information, visit, Science Museum of Virginia or call 804-864-1400.